While we say a big ol' "Congrats!" to Brian Buda who won our last True Fan Contest, we also say to all of you, "Ready for more?" Thought so. You may not have won WAR HORSE, but John Williams isn't hardly done there. 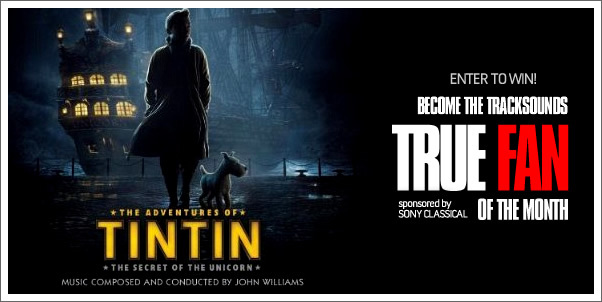 In just a couple of weeks THE ADVENTURES OF TIN TIN: THE SECRET OF THE UNICORN will be released and Tracksounds is proud to partner with SONY CLASSICAL to give you a chance to win the original soundtrack! Follow the link below for all the glorious details!